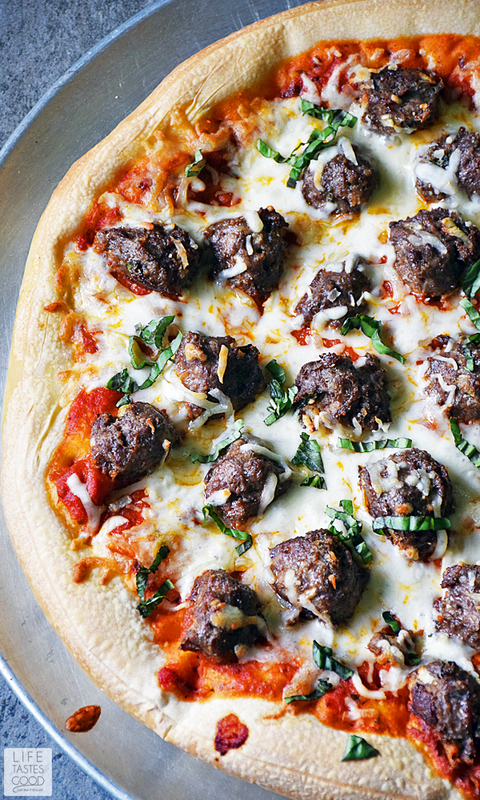 This incredibly tasty Meatball Sub Pizza is even better than the traditional sandwich! It's easy to make, too. 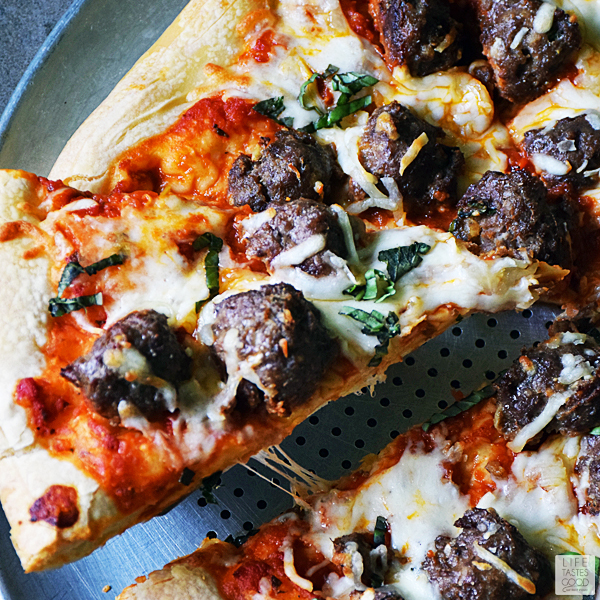 I use leftover meatballs and red sauce and store bought pizza dough for a quick and easy dinner the whole family loves! October is National Pizza Month. 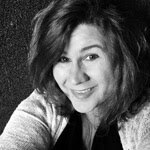 The #SundaySupper Tastemakers couldn't let this National event pass us by! Today we are sharing our Best Pizza Recipes so you can celebrate National Pizza Month with a different homemade pizza every day...twice even! We LOVE pizza! Especially homemade pizza with creative toppings like my Chicken Parmesan Pizza that tastes like Chicken Parmesan only better because it's pizza! Or my Spinach Artichoke Pizza you'll swear is just like your favorite dip recipe, and the ever popular Cheeseburger Pizza that even has pickles on top with ketchup and mustard! Who would have thought pickles would be so delicious on a pizza?! If you want to try a slightly spicier pizza, I recommend my Jambalaya Pizza recipe. Who says you have to have Jambalaya in a bowl?! As you can see, Don and I are always putting our favorite flavor combos on pizza dough. Enjoy Spaghetti and Meatballs first by making my homemade Red Sauce and Easy Meatballs. The sauce recipe is very easy to make and simmers all day in a slow cooker for best results. The meatball recipe uses fresh ingredients to maximize flavor and cooks in the oven for easy cleanup. 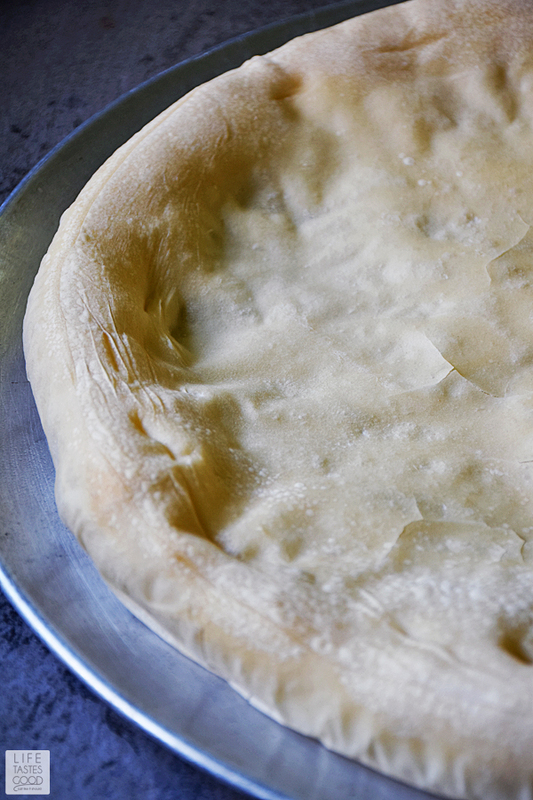 Purchase your favorite pizza dough from your local grocery store or even from your favorite pizzeria. The Publix Bakery makes a delicious pizza dough and they even sell it already rolled out! Totally worth the few extra pennies! I cook the dough just until it starts to brown very slightly and then I top it with 1 cup of Red Sauce. I caution you not to use too much sauce or the pizza could end up soggy. You can always serve a little sauce on the side for dipping if you like. 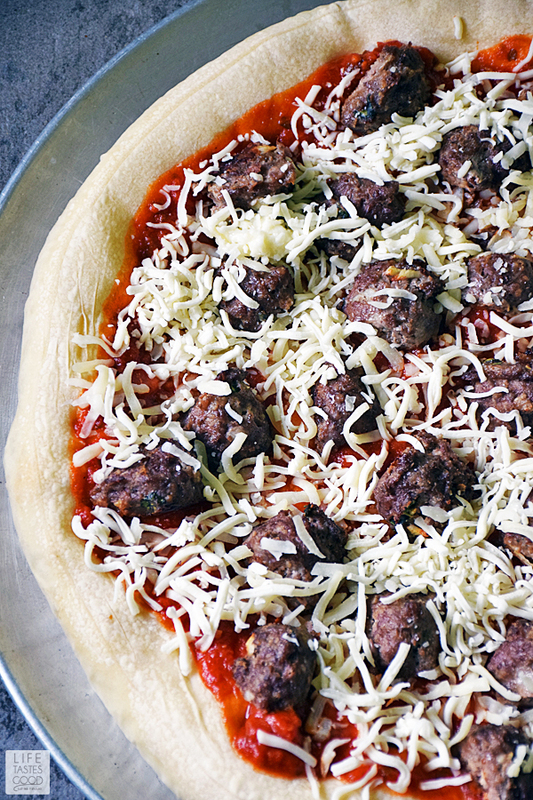 Cut the meatballs in half so they aren't too bulky on the pizza. It also helps to stretch them. I use about 12-15 meatballs sliced in half when I make this pizza, but how many you use will depend on how closely you arrange them. I use 1 cup of shredded mozzarella cheese. You can use more or less depending on how cheesy you like your pizza. I've found a cup works best for our tastes. 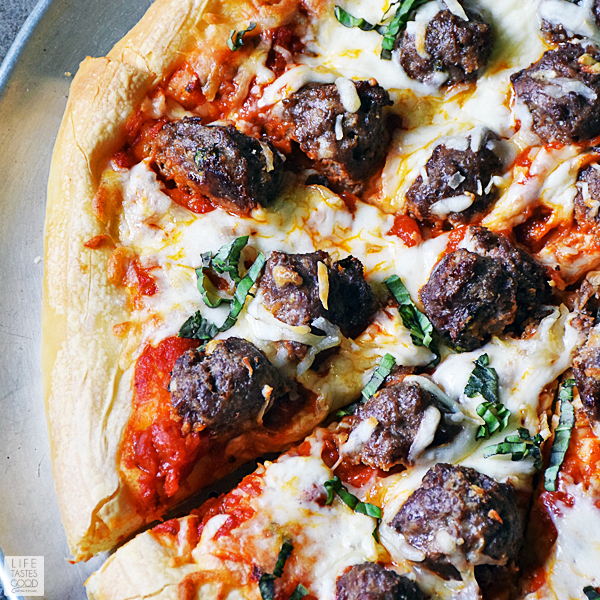 This incredibly tasty and easy recipe for my Meatball Sub Pizza is even better than the traditional sandwich! Spray 16" pizza tray with cooking spray. Roll out dough into 16" round and place dough on pizza tray. I like to let it set out for about an hour to rise a little before baking, but you can bake right away if you prefer. Preheat oven to 400°F. Bake pizza dough in the oven for 8-10 minutes until it just starts to brown lightly. 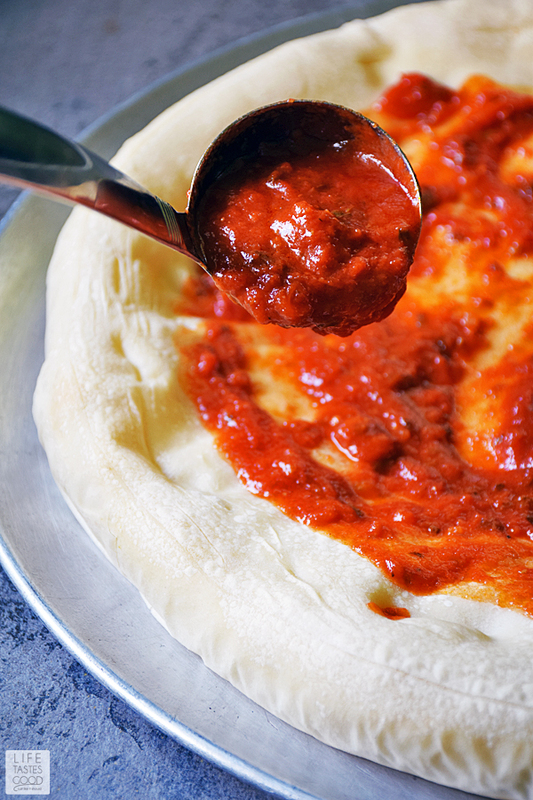 Remove the dough from the oven and top with 1 cup Red Sauce and spread it around to cover the dough. Top the sauce with the halved meatballs and sprinkle with 1 cup shredded Mozzarella cheese. Bake in the oven for another 10 minutes or until the cheese is melted nicely and the crust is toasted to your liking. Remove from the oven and let rest 10 minutes before slicing. Garnish with freshly chopped basil leaves. Enjoy! Uhm a meatball sub on a pizza sign me up!! Great idea to use those extra meatballs in a pizza! This sure looks better than any home delivered pizza! We prebake the dough a bit at work too. It makes a much sturdier crust! Meatball subs were always a fave with me, can't imagine how yummy it would be on a pizza! We LOVE meatball subs. 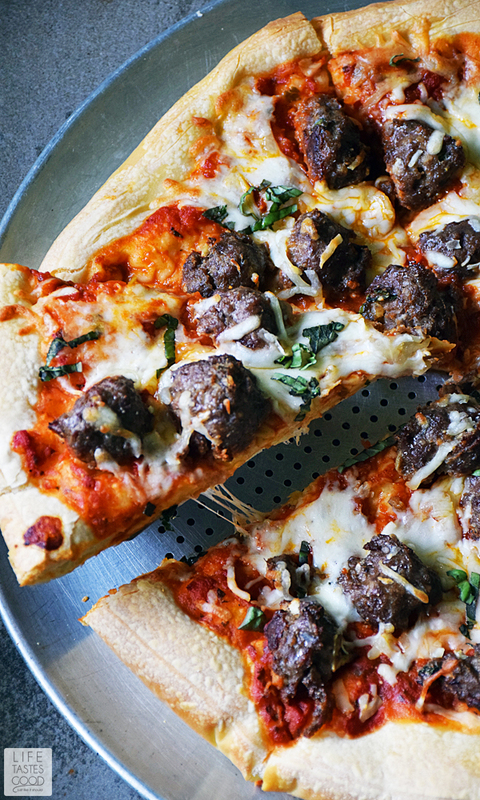 You know we're going to LOVE this meatball sub pizza. YUM!